Good urban planning and design are critical for making a neighborhood a welcoming place where people want to be. This is the fourth and final piece in a series of articles, Planning Principles, in which we provide examples of how Rosslyn has employed urban planning and design best practices to make the neighborhood a better place. The other articles in this series include a story about successful pop-ups in Rosslyn, a piece on our upcoming parklet and an article about green buildings in Rosslyn. With 25,000 employees and 14,000 residents, Rosslyn is evolving into an increasingly vibrant community. As more people choose to call Rosslyn home, retail has surged: Seventeen new restaurants opened in the past two years, with more on the way. Meanwhile, many new, mixed-use development projects, such as Central Place, have also come online, bringing together retail, residential and business communities in one place. Rosslyn today looks different than it did ten or fifteen years ago, and it also feels different. This is in large part because of the placemaking efforts of the Rosslyn BID. Placemaking is a multifaceted approach to the planning, design and management of public spaces. It is a key element of the Rosslyn BID's work in creating a welcoming environment that can be enjoyed by everyone. Visual identity and sense of place help to create a welcoming, comfortable and cohesive environment that encourages people to gather and stay longer. To achieve this, the Rosslyn BID employs a multi-faceted approach to visual branding. This includes branded light poles, Big Belly trash cans (with event advertisements embedded), coordinated landscaping and branded hospitality Ambassadors (pictured above). Recently, the BID designed and installed custom streetscape furnishings that will be deployed throughout the neighborhood. Not only do these reinforce our sleek, modern aesthetic, but they provide great utilitarian value to the community while serving as a unifying element. Additionally, the BID will introduce Arlington County’s first parklet next spring. This extension of the sidewalk will provide public seating, and is designed to match the streetscape elements being introduced around the same time. Besides our year-round landscaping, which provides continuity across the neighborhood, the BID also installs seasonal flourishes throughout the public realm, fostering a sense of excitement for changing seasons and holidays and helping to drive awareness of our programming and events. The Rosslyn BID also activates the neighborhood with over 160 public events each year. 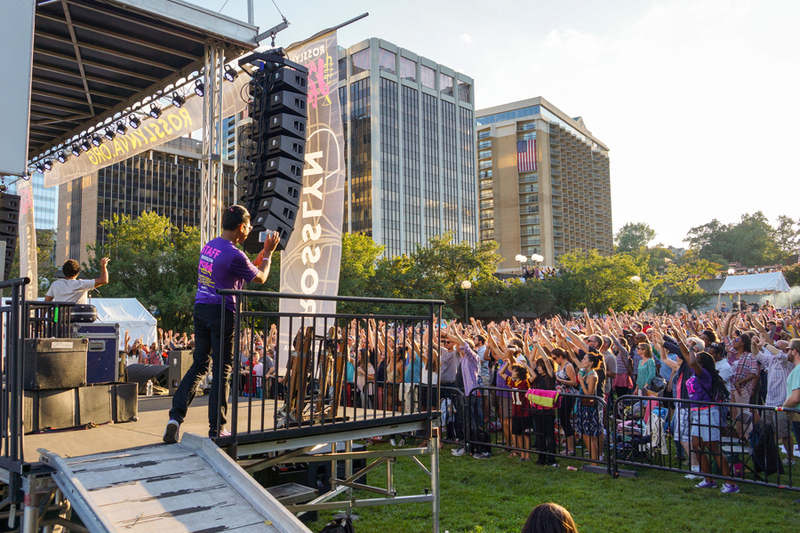 Our largest, the Rosslyn Jazz Fest (pictured above), marked its 27th year this fall with a record attendance of almost 10,000 people. In June, we programmed our newly opened Central Place Plaza stage with concerts every Thursday. The local cover band White Ford Bronco opened the series. More than 800 people packed onto the plaza to enjoy the show. We also programmed a weekly farmers market to not only supply the neighborhood with fresh offerings, but to draw more attention to the plaza and encourage people to visit retailers nearby. Our traditional summer movie series has attracted over 18,000 people per season, so last year we added a new element to activate the back of the park as well. The Pub in the Park features a mobile bar with draft beer, wine and sangria. We also engage local food trucks and provide games, giving people an opportunity to make a night out of their experience. Finally, and probably most important, the Rosslyn BID builds community through activation and improvement of our physical spaces. For instance, for years a public fountain in Gateway Park West sat broken and unused. We hired local artists to paint colorful murals on the structure, filled it with sand and toys and provided Adirondack chairs for parents to relax in while their kids play. The sandbox (pictured above) has been a huge triumph for the Rosslyn community and continues to be used by local families. Elsewhere in Gateway Park West, the BID partnered with Arlington County's Parks and Recreation department to create a pop-up, temporary bonfire as part of our Holiday Market two years ago. It was such a hit that we were able to collaborate with the County to build and install a permanent fire pit structure. Now we can program activities for our residents to enjoy this space year-round. Another great example of how we've activated the public realm is the new Continental Beer Garden. Once a vacant lot located on a prominent street corner in the heart of Rosslyn, it was completely underutilized. In 2014, the BID worked with the property owner to revitalize the space and create a public gathering spot. It became such a popular place for people to enjoy lunch and meet up with friends and coworkers that that we decided to host pop-up events on this new plaza, such as beer gardens held in partnership with the nearby Continental Pool Lounge. After several packed events in this space, we had proven the concept and Continental Pool Lounge decided to lease and build out the plaza as a permanent beer garden. Now, Continental Beer Garden is packed every day after work, in the evenings, and on weekends and has received national acclaim in the press. This example shows the full potential permanent effect of placemaking, transforming an unused space into a hot, new retail establishment. 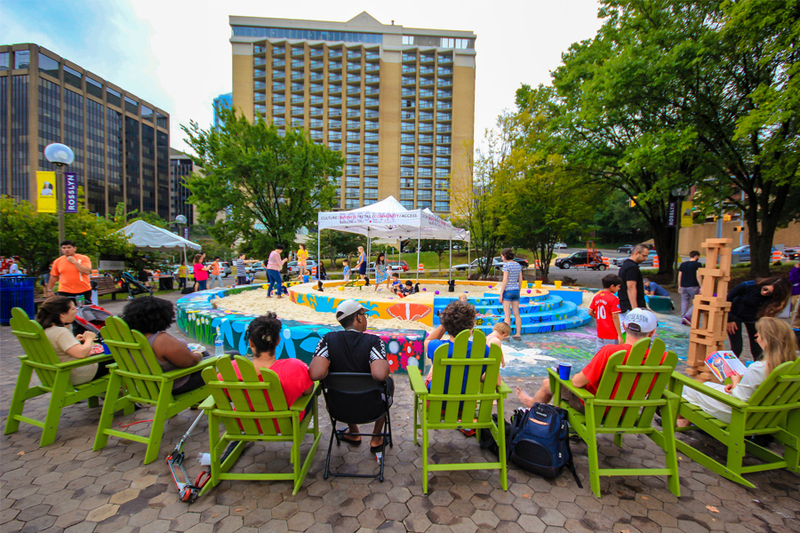 "Placemaking is a way to create a place where people will want to stay," says the Rosslyn BID's urban planning and design manager. "We're delighted that, by reimagining spaces throughout the neighborhood, we've been able to turn them into their own unique destinations." 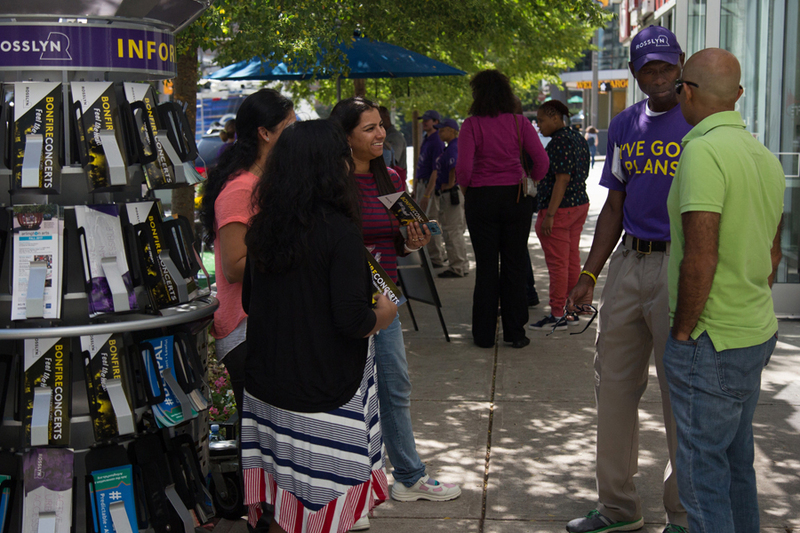 To learn more about the Rosslyn BID's placemaking efforts, check out this video. Photo at top: People gather to get ready for Rosslyn Cinema on a summer Friday night in Gateway Park. Two years ago, the Rosslyn BID expanded movie night to include a Pub in the Park, games and food trucks, enabling people to make a night out of the experience.